Ghoulies, a rip-off of the 1980s classic, Gremlins, is a 1980s camp fest (it is oh-so '80s, down to the dialogue and big hair) primarily known not for any particular scenes, but for this poster. My computer screamed when I opened this picture! The infamous poster became notorious for convincing children that, should they go to the restroom, a green aborted child of Kermit the Frog would leap out and attack them. Rightfully so, parents were angry, and wrote a number of complaint letters to the studio. 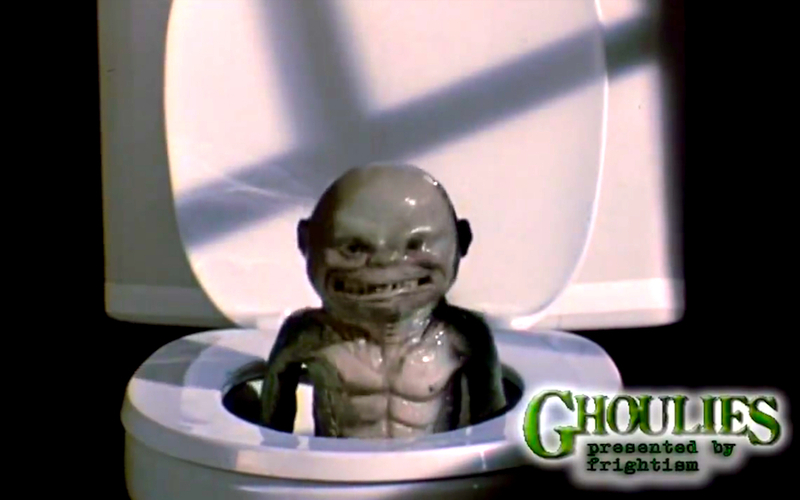 Thus how most people remember Ghoulies as the film that turned toilets into objects of sheer terror. Holy hell look at him. He looks like Gizmo’s inbred cousin decided to mate with a rejected puppet from Labyrinth. I’m not sure if they are supposed to be the stuff of nightmares, or monsters-that-are-so-hideous-they’re-kind-of-cute. 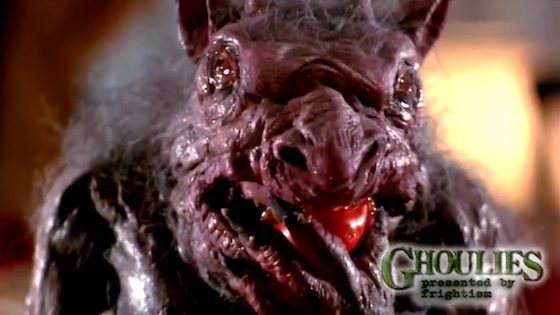 The ghoulies move like animatronics in a country fair’s haunted house, and their only way of speaking is to screech. I am not sure how many drugs the puppeteers took before creating these monstrosities, but suffice to say I’d be amazed if they’re still alive. - Two guys roll up on what appears to be a glorified go-kart. As everyone knows, all the best parties begin with go-karts. - We are then introduced to Toad Boy, who shrieks out, “Toad Boy needs some sweetmeats for his tum!” None of the other characters seem to acknowledge the fact that Toad Boy is either (a) possessed or (b) schizophrenic and instead brush him off as being “quirky”. Out of all of the characters in the film, I was deeply concerned about Toad Boy and kept wondering when he would receive an intervention. - And to top it all of, “break dancing” performed by a non-union Dana Carvey. This is, indeed, the ultimate party. All of this is too boring for our host, who decides to corral everyone into the basement for everyone’s favorite party game -- the Satanic ritual! Naturally, everyone decides that watching non-union Dana Carvey bust out some more moves is far better entertainment, so they leave their host, who has brought the ghoulies to life! He gives them impossible names to pronounce, so from here on out, they shall be referred to as Bob, Stuart, and Kevin. My computer even started laughing at this! I don’t want to give the rest of Ghoulies away, but in short, it’s hilarious. There is nothing even remotely frightening about this film, so even your wimpiest friend will be able to handle it. There is also no shortage of things to make fun of, so it is perfect for watching in a big group. And if you enjoy the insanity of Ghoulies, remember that there is a Ghoulies II and Ghoulies III: Ghoulies Go To College (perfect for any toga-themed parties).